A drama about the hard life on an independent farm, The River is an adequate story about the struggle to save a way of life, limited by its simplistic depiction of good and bad. In a Tennessee valley, Tom and Mae Garvey (Mel Gibson and Sissy Spacek) and their two kids run a family farm located near a raging river, growing corn as their main crop. Frequently battling against flooding and poor prices, Tom is deep in debt and barely holding on. 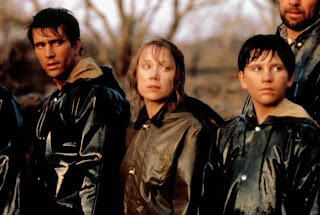 Other nearby farmers do go bankrupt, and their property is scooped up by the ruthless Joe Wade (Scott Glenn), Mae's former lover and the owner of the big local business looking to build a dam and flood the entire valley to improve water supply. When Tom's finances take yet another turn for the worse, he is forced to seek temporary work in a remote town, leaving Mae and the kids to tend the farm. Tom finds himself unintentionally harming the livelihood of others, while his absence opens an opportunity for Joe to make his move to try and reclaim Mae's affection. A bad crop and yet another flood push the Garveys to the limit. Part of a series of films from the mid-1980s highlighting the plight of the small farmer, The River keeps its focus small and the emotions intense. Directed by Mark Rydell with sumptuous, close-up dominated Vilmos Zsigmond cinematography, the film rumbles from one predicament to the next, as Tom's story unfolds like a traditional country song: a flooding river, overturned machinery, dwindling finances, no more credit from the bank, poor returns from an auction sale, bad crops, and an overheating tractor. Even the cow dies. It's all a grim, unrelenting daily struggle for survival. The only thing going for Tom and Mae is their love for each other, and amidst all the agony Rydell takes the time to show the strong bond between husband and wife that allows both of them to persevere. It does not hurt that Mel Gibson, who powers through the movie with a singular I'm-busy-broke-and-bitter-so-don't-bother-me expression, must be the handsomest farmer ever, and Spacek, in an Academy Award nominated performance, conveys understated and deep passion for both the land and her man. Rydell takes one interesting detour away from the rigours of farm life. When Tom goes looking for any type of income to keep the farm afloat, he finds a job that piles agony onto others who are as desperate as he is. The film still manages to portray Tom as victim unknowingly trapped into a messy situation, but he learns a harsh lesson that even righteous indignation can have its limits when survival is at stake. The conflict between small farms and big business is simplistically represented, a draw-by-crayons battle between good and bad, with the small, dedicated family-run farms representing hard graft and good traditions, while big business is all about greed and destruction. Scott Glenn presides over the boardrooms of evil with an effective if humourless stance, but the entire asymmetrical battle is portrayed with the sophistication of a fairy tale. The River runs strong, but very much in a predictable direction.